Délia Tétreault, foundress of the Institute of the Missionary Sisters of the Immaculate Conception, is one such model for us to imitate. In a letter to her sisters, she says: "I feel that it is urgent to tell you and to repeat without stop: let us live solely for the interests of God!" (Letter, February 26, 1923). For Délia Tétreault, the essential element of life is the love of God and union of one’s heart with his. In her personal notes, she would write: "Adored Master, from whom I receive all things, I want to give you a little love; I want to love you and make you loved as much as a poor feeble creature is able to." (Personal Notes, July 10, 1904). During her whole life, Délia Tétreault was docile to the guidance of the Holy Spirit. On February 13, 1921, she exhorts her companions to do the same : "Courage! Confidence! Let us go ahead, more than ever, doing what is most important: the great work of our sanctification! Do not worry about anything, live joyfully! [...]Work for the interests of God, and he will look after yours!" In March, 1927, when Délia was advising her sisters to simplify their spiritual life, she said : "humility, obedience in faith, work well done…". Where do I situate myself on the road to holiness? It is my duty to follow it well and to always march ahead. Délia knew how to follow the road of holiness! We, humbly believe that Délia Tétreault is a Saint!... In another of her letters, she says : "We must go to God simply and share with him all our small problems just as we would to a mother or a father that we love and we know loves us." 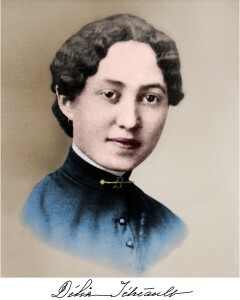 (Letter, January 30th, 1916)… Délia is a SAINT who knew how to live the GOSPEL throughout her whole journey on earth. She was full of Jesus Christ and God did great things through her. Yes, this admirable woman of god had the courage to walk the path of holiness. How we would love to say : " Saint Délia Tétreault, pray for us!" Why speak about "a c a u s e"? In our everyday life, what is a cause? A cause is something that is important to us. A cause can be political, charitable, legal and even religious… In the Church, we have the cause of the saints, wherein through a diocesan tribunal, every detail of the life of the person that is to be canonized is studied according to scientific, historical, theological, juridical and pastoral norms… This does take a long time. That is the big question! Is Délia Tétreault an authentic saint or do we just think that she is a saint? Does this woman really merit to be declared a saint? Even if she lived an exemplary life and even if thousands of people have already canonized her in their hearts this does not suffice for the institutional Church. Before the Vatican canonizes someone there must be a trial - a real trial with real lawyers! We do not know how long we still have to wait before Délia is canonized. Even if the Church has canonized many persons it cannot do so without proof… and these proofs must be very clear. In what concerns Délia Tétreault, the dossier of the Acts of the proceedings count more than 12,903 pages! The writings of Délia Tétreault were thoroughly examined. At the diocesan inquiry, 51 witnesses were heard. All the information was bound and assembled into 2 series of volumes. The first series contains 24 volumes (8080 pages) and the second series contains 14 volumes (4823 pages). An M.I.C. team was sent to Rome with all these documents in order to write a thesis that is called The Positio. This document was used for the final examination of the cause. An authentic miracle is an event of healing that goes beyond all rules of nature. This miracle is analyzed to the last detail by a group of medical doctors who are not necessarily believers. There must be no doubt that medically nothing more can be done. For the Catholic Church, the miracle is like the "signature of God" given to the heroic living out of the Christian Virtues and the commitment of the person to be canonized. When someone is canonized, the name of this person is then included in the Holy Canon of the Church, that is to say, it is included in the list of the Saints of the Church. That is why we call it CANONIZATION. Then, we can publicly pray to the canonized person. Why is it important to have someone canonized? Many of us often ask ourselves why a person must be declared a "saint". Our postulator, Father Paul Molinari, S. J. tells us: "A saint makes it possible for Christ to live his life in them, to reveal himself in their own unique personalities, and according to the gifts and qualities bestowed on them. Everyone who puts on the mind and heart of Christ radiates his compassion and the power of his attractiveness in their particular circumstances so that they draw others to him through the qualities of his goodness flowing out of them. Furthermore, these people are as human as ourselves in their limitations, their characters, their genius, their capabilities and gifts, their learning and culture. They inhabit the same world as we do, children of the same times, the same human predicament. The difference is that they live in such close contact with him as to be wholly taken up with him, moved and directed by his Spirit. When we come into contact with such people, we experience a lively sense of presence of the God who has turned their lives upside down by the force of his love." When someone is canonized, the person becomes a sacrament of God’s presence. Saints do not take God's place but reveal God. The inner beauty of a saint brings us closer to God who is the very source of this beauty. Through the sign, one can admire God’s greatness and love. In fact, saints are ordinary people who allowed the Spirit of God to shine through them in a very extraordinary manner. What we admire in a saint is the revelation of the richness of God that goes through the richness of human beings. For us, Mother Délia is such a person who God has led through hills and valleys. With her missionary heart and her thanksgiving spirit, she is our model and inspiration. In his presence, we experiment the universality of God's love. She shows us the way to God. mission in the Church of Canada. missionaries of the Good News in the world. and through the Spirit who makes the Church alive."